Curated by Delphine Bedel and Docus van der Made. Masterclass: 12:00 – 14:30h. Tickets €7,50- (€5,- for students). Reservation required, limited seats. Artists talks: 15:00 – 17:00h. Tickets €5 (€3,50 for students). Open to all, reservation recommended. 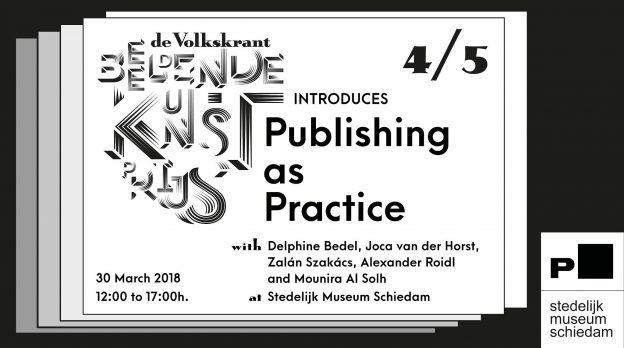 ‘Publishing As Practice’ is a Friday afternoon programme celebrating self-publishing in all its forms, organised as part of the series “de Volkskrant Beeldende Kunst Prijs INTRODUCES…”. Together with the invited artists and designers we will explore models of production and distribution of books, printed matter, and multiple digital formats. Discussing the new publishing culture of self-publishing, book fairs, and curated bookshops, the program with touch on oral histories, tales of resilience, language, migration and war, feminism and education, urbanism and political struggles. Publications presented address urgent contemporary issues, and bring forward the potential of publishing as practice. Tools for contemporary self-publishing practices, modes of operating in, and points of departure for self-publishing. Limited seats, reservation required via info@stedelijkmuseumschiedam.nl (please reference ‘masterclass’ in your reservation). Project realised within Master Design: Experimental Publishing at the Piet Zwart institute. This publication about the Poortgebouw, a former squat and vibrant living community in South Rotterdam. To book interlaces oral histories with material from various institutional and personal archives to bring together tales of resilience, political struggle, frustration and friendship as a new perspective on both Poortgebouw’s unique history and its importance in the contemporary city. Students share insights on their practice and collaborative process to develop the publication. Conversation will cover engagement with cultural heritage and archiving practices. Bedel will discuss her practice as artist/publisher, showcasing different projects and her publishing house Meta/Books. Her principal topics of interest are media, cultural representation, feminism and the global circulation of images. She founded Meta/Books to empower creatives to self-publish. Meta/Books promotes expanded publishing practices from print to digital, questioning the way information is displayed and manipulated through the publishing process. Mounira Al Solh will present her recent projects for Documenta 14 and her magazine NOA (Not Only Arabic). In her studio in Beirut, over the past years Al Solh has hosted talks by artists and started NOA (Not Only Arabic) magazine, a journal where artists and writers are invited to send in their thoughts, texts and images by invitation from the artist and guest-editors. NOA magazine does not get distributed and gets published on an irregular basis. Ticket reservations possible via info@stedelijkmuseumschiedam.nl (please reference for which part(s) you’re reserving). The series VKBK-prijs INTRODUCES… is a component of the exhibition with the nominees for the Volkskrant Visual Art Award 2018, on view at Stedelijk Museum Schiedam until 15 April. Delphine Bedel is an artist, publisher, lecturer and Creative Director of Meta/Books. Bedel has contributed to the emergence of a new publishing culture that splices together photography, art, and design, and empowers a new generation of artists to self-publish. XPUB is a two-year Media Design Master course that prepares students to critically engage with societal issues within the fast changing field of art, design and cultural production. Mounira Al Solh is a multidisciplinary artist whose work has been shown internationally, such as in solo shows at Sfeir-Semler Gallery in Beirut and Hamburg, the Stedelijk Museum Bureau in Amsterdam, CCA Glasgow, at the KW in Berlin, and Kunsthalle Lissabon, and most recently at the Documenta 14 and the Art Institute of Chicago.